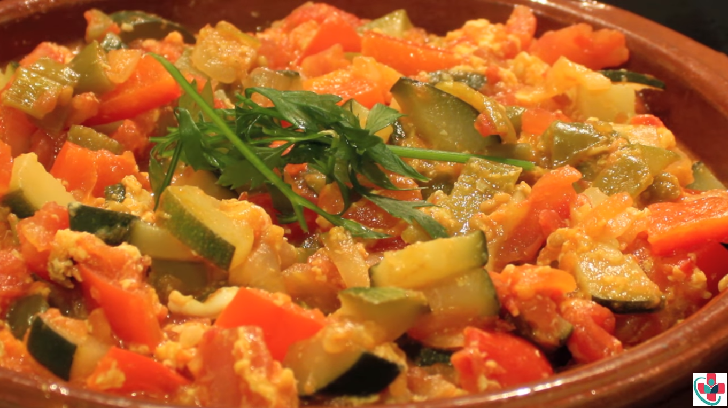 This classic vegetable stew dish made of zucchini, green and red peppers, onions and tomatoes. It can also include eggplant, bonito or tuna fish, boiled or scrambled eggs, bread, etc. It is usually consumed warm as a side- or as a first dish. There are also variations in the cooking point: some people like it really cooked for a long time until it looks almost like a cream, some people prefer to notice the pieces in the mouth. If you want to use it as a side dish I think that the more cooked the better. As a first dish, I prefer it less cooked. If you see that your stew has too much liquid, just let it cook uncovered for some more minutes to allow part of the liquid to evaporate. And finally, a tip if you don't have good juicy tomatoes: you can substitute the fresh tomatoes with canned diced tomatoes. They work perfectly fine. Enjoy! ⏩Cut zucchini, green and red peppers, and onion in small cubes or slices. ⏩Make a cross cut on the top of the tomatoes and submerge them in boiling water for 30 seconds. Strain and remove the peel. Dice the tomatoes and reserve. ⏩Heat the oil in a pan at medium-high heat and add the onion. Add a pinch of salt and cook for about 4 to 5 minutes. Add the green and red peppers and cook for 5 to 7 more minutes. Add the zucchini cubes, the bay leaf, and the sweet paprika and cook some minutes at medium heat. Then you can add your diced tomatoes and cover. Cook for 10 to 12 minutes at medium-low heat. ⏩Grate a tomato and add the puree to the veggies. Cook for 4 to 5 more minutes until the tomato is cooked. ⏩Optionally beat one egg with a pinch of salt and add to the mixture, cooking it for about 2 more minutes. Serve it warm along with some bread.